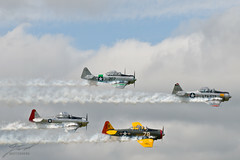 I think my favorite performance at the 2009 Selfridge Air Show was the four T-6 Texans. I could have done without all the smoke (if nothing else it made for poor shots as it dissipated) but really enjoyed the show. That's an incredibly cool shot. Not too many airshows near me, so not sure I ever have really ever seen it up close. But very cool!